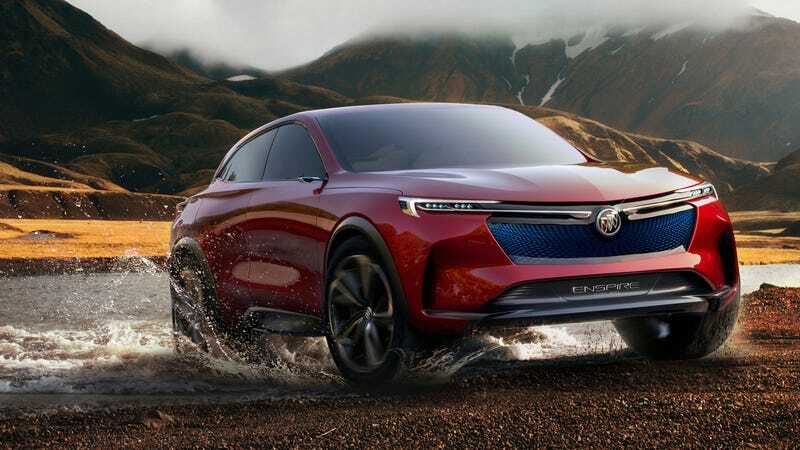 I know that pretty much all of the brands are trotting out electric SUV concepts, but this new Buick Enspire concept thing actually looks pretty sharp. The only crappy thing about it is its name. The all-electric SUV concept was unveiled today in China. It has a motor that can generate 410 kW (550 horsepower), with a zero to 60 mph time of four seconds. It has a range of 370 miles per charge—but again, this is just a concept car. Buick can say whatever it wants about it. What I am digging immensely are its looks. Sure, it’s an SUV, but it is sleek and streamlined, not blocky and boxy like typical SUVs. Buick’s new corporate face is a good one; simple and refined, a look that I think will age quite well. The only issue I have with the concept is its name: The Enspire. Clearly, it’s meant to be a part of the Buick SUV family and join the Encore, the Envision and the Enclave. Those en-prefixed words are authentic. Cut that crap out and you’ll have a solid electric concept, my friend.